Ark Country Store offers All Seasons Feeders. All Seasons Wildlife Feeders are built to hold up to the harshest environments Mother Nature has to offer. Their exclusive designs are made to deliver feed to target animals while reducing waste on the ground. 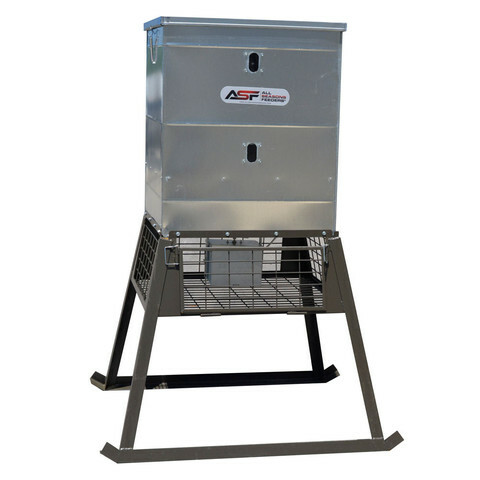 The 600lb Stand and Fill Feeder maintains the quality and durability of our traditional 600lb broadcast feeder while offering you a much safer way to fill your feeder, from the ground, without ladders! Find out more about this feeder here. Stop by Ark Country Store for all your hunting supplies. We carry deer corn, protein, blocks, attractants, hunting gear and All Season Feeders! Stop by today for All Seasons Feeders’ batteries and accessories. This entry was posted on Wednesday, July 19th, 2017 at 5:40 am	and is filed under News & Updates. You can follow any responses to this entry through the RSS 2.0 feed. Both comments and pings are currently closed.